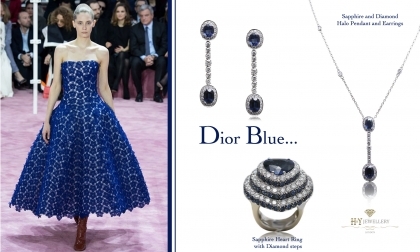 The cobalt blue is still a staple for any beauty who wishes to make an elegant statement, Dior's S/S 2015 collection displays shooting strikes of the amazing colour and we feel the perfect finishing touches to these pieces would naturally be sapphire and diamond adornments. Keeping it seasonal we have included our amazing heart sapphire and diamond ring, perfect for your love this Valentine's day, with other more simple but classic simple drop earrings and pendant to add to the beautful hue. Find these pieces and more in our Jewellery catagory and select the sapphire option.